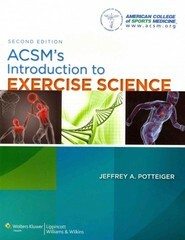 ACSM's Introduction to Exercise Science 2 Edition Developed by the American College of Sports Medicine (ACSM), this engaging and authoritative book provides an overview of exercise science and related areas, such as athletic training and sports medicine, to help readers develop an understanding of the basics of exercise science and the range of career paths in the field. Now in striking full color, this Second Edition reflects the most current trends and theories in the field and is enhanced by dynamic new videos that showcase different careers in exercise science. Demonstrating how exercise science principles are applied in real world settings, the book covers all the core disciplines of exercise science, including biomechanics, exercise physiology, sports psychology, motor control and learning, nutrition, and sports injury. An ACSM (American College of Sports Medicine) publication, this book reflects the standards for quality and excellence set by the leading exercise science organization in the world. Gain insight into what it takes to prepare for a successful career in the field through fascinating interviews with prominent exercise science professionals—now enhanced by NEW video clips. Enhance your understanding of a wide range of exercise science careers through NEW Video Fieldtrips that explore different real world settings. Master key concepts through chapter objectives, key terms and definitions, chapter summaries, review questions, and Thinking Critically boxes that pose questions to stimulate further thought.